Science is awesome. This year alone scientists have discovered a new extinct species of carnivorous animal and a material which repairs itself when smashed. And now we have a new colour. Back in 2009 (though just recently announced) a grad student at Mas Subramanian’s lab was mixing together some chemicals when they accidentally discovered a new colour. This is the first new blue pigment to be discovered in over 200 years. The last blue pigment was cobalt blue, which was discovered by French chemist Louis Jacques Thenard in 1802. The new blue colour is currently named YInMn blue, after its chemical composition – a mixture of combined yttrium, indium, and manganese oxides. You might be wondering why this is all such a big deal. Well, apart from the fact it’s the first new blue pigment to be discovered in a very long time, YInMn blue is also highly durable. It reflects more heat than cobalt blue and can endure sunlight, water and oil better than all available blues. Colour isn’t just there to look pretty after all. 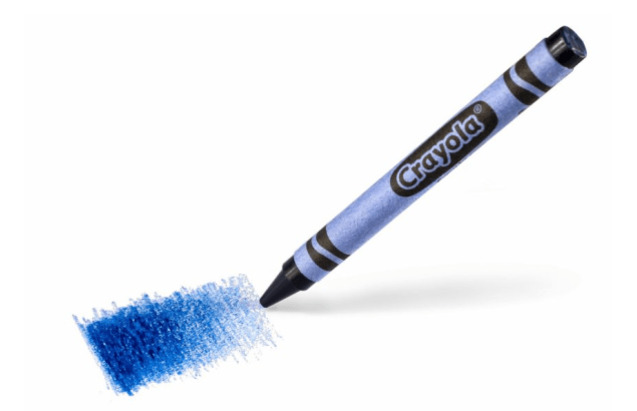 A lucky science accident has led to the creation of a new crayon. Source. If you’re concerned about the strange name of the colour don’t worry – it won’t be called YInMn for much longer. The Shepard Colour company have licensed the colour from Subramanian and are testing toxicity levels to get FDA approval. If all goes according to plan the colour will soon be available in crayon form (hoorah!). The new crayon will replace Crayola’s recently retired yellow dandelion colour. However, that also means the colour needs a better name, and this time it won’t be left to the experts. The clever folks over at Crayola are currently holding a competition to name the new pigment before its official release. So, if you’ve ever wanted a crayon called something cool like, Da Ba Dee, we suggest you get a move on over to the website to submit your idea pronto.